It is events and incidents that bring about the best and the worst in people. The Biafran Leader Mr. Nnamdi Kanu has been illegally detained for over a year by a sick lunatic dictator called Muhammed Buhari. He President Buhari have a history of abuse, murder, blackmail false arrest and bogus charges to procure false imprisonment of an opponent. 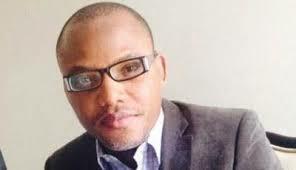 Mr. Nnamdi Kanu is a highly respected leader of Indigenous People of Biafra (IPOB), he committed no offense other than to speak out against calculated repression, injustice, indiscriminate murder of a cross-section of human beings out of hate and not the least deprive him and his people freedom of speech, expression, association, and constitutional right to advocate for freedom where there is absence of love and respect for whatever reason that have lingered since from 1914 - 2016. You were once a constitutional scholar and now a Judge of a Federal High Court. You might have been a Barrister for the defense or the prosecutor, we know the reason you chose this profession is to uphold justice and abhor injustice no matter whose ox is gored. Therefore, Judge BINTA NYAKO you have been handed a case that has no merits or truth to it other than a case based on hatred and ego of a man that have no regards for other people’s well-being. We are watching, the whole world is now watching since Buhari and his killing squads have been exposed. The illegal DSS, SSS and Uncle Tsoho we are watching. UNCLE BUHARI, THE WORLD IS WATCHING. JUDGE BINTA, CAN YOU ASK YOURSELF, I BINTA NYAKO, AM I GOING DOWN WITH MUHAMMED BUHARI? OR AM I TO DELIVER THE CORRECT VERDICT WITHOUT FEAR OF INTIMIDATIONS AND BLACKMAIL? We ask you this, will you, your children, husband, and entire family at the end of this case be proud of you or live in shame and disgrace? AT THE END OF THE TRIAL, WILL IT BE YOUR SWORN OATH TO UPHOLD AND DELIVER THE CORRECT VERDICT OR WILL IT BE THE VERDICT OF "HER MASTER'S VOICE?"